Demonstrators protest against Brazilian President Dilma Rousseff and the ruling Workers’ Party on Paulista Avenue in Sao Paulo on Aug. 16. Photo Credit: Nelson Almeida/AFP/Getty Images. Brazil has experienced a major economic downturn over the past five years, since President Luiz Inácio Lula da Silva left office. In 2010, Brazil was enjoying 7.6% GDP growth, making it the world’s seventh largest economy. In 2010, 62% of Brazilians described the economic situation in their country as good. But as growth diminished more rapidly in recent years, public assessment of the economic health of the nation also has fallen sharply, by 27 percentage points from 2013 to 2014. In addition, a 2014 Pew Research Center survey found that 63% of Brazilians disapproved of the way Rousseff was handling the economy. With a projected contraction in Brazil’s economy over the next 12 months, things look even bleaker for this year. Only 13% of those surveyed by Pew Research last spring say economic conditions are good. From 2013 to 2015, Brazilians’ perception of their economy fell by a staggering 46 percentage points. 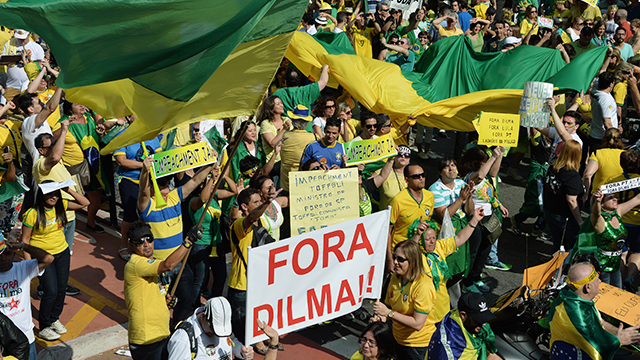 To make matters worse, Brazil is experiencing one of the worst corruption scandals in the country’s history. An investigation of state-controlled oil company Petrobras, Operation Car Wash, has been underway since 2014. In the spring of the same year, 86% of the Brazilian public voiced disapproval of Rousseff’s handling of corruption in the country, and 78% cited corrupt political leaders as a very big problem. Only six-in-ten Brazilians now have a favorable view of their own country, with 39% voicing an unfavorable opinion. This includes a sharp decline in opinion of Brazil in the past year, with favorable views dropping 17 percentage points since 2014. Note: See here for topline results and methodology for Brazilians’ attitudes toward their own country.